cut into lengths to any length: desired by the customer. 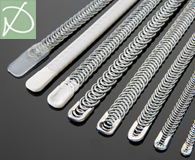 The spring ends can be equipped either with ends being sintered in plastic, with metal caps or with plastic tongues, according to the customer's requirements. It is even possible to equip the spring ends with different types of equipment. In the following product overview you can find all details of the spiral metal bonings including their different types of versions that can be supplied; please put a cross next to the desired spiral metal boning, then select the desired version and send us all as an enquiry. You will receive the corresponding offer immediately.